Monarch Air Group provides private air charter in Scottsdale, AZ. Our clients benefit from top-notch service, unrelenting dedication to safety, wide selection of aircraft, and years of experience in chartering private jets. To obtain a free quote, please use our online quoting tool provided below, or call toll free 1-877-281-3051. Scottsdale is the city in the state of Arizona, which is located in the heart of the lush Sonoran Desert. 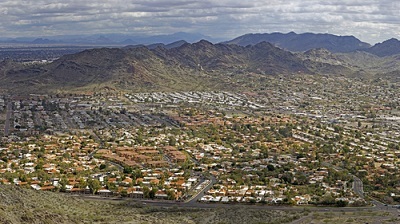 It borders on Phoenix to the West and the McDowell Mountains on the East. Scottsdale began as a small farming settlement and has a rich Western history, hence it’s often referred to as “The West’s Most Western Town”. With desert trails, mountains and rivers, Scottsdale is among the best tourist destinations for both business and leisure travelers. There are many excellent shops, stunning art galleries, luxurious restaurants, five star hotels, noisy nightlife scene, and over 200 area golf courses. The most popular tourist attractions are the month-long Scottsdale Jaycees Parada del Sol, the Scottsdale Arabian Horse Show, the renowned Scottsdale International Film Festival and the famous Barrett-Jackson Auto Show. Visitors from all parts of the world come to Scottsdale to experience relaxing days, lavish luxury, and nice warm weather throughout the year. 6. LUF, Luke Afb, Phoenix, United States. 1. Scottsdale, 6850 E. Main Street, Scottsdale. 2. FireSky Resort & Spa, a Kimpton Hotel, 4925 North Scottsdale Road, Scottsdale. 3. Chaparral Suites, 5001 Scottsdale Rd, Scottsdale. 4. 4th Floor Grille & Sports Bar at Chaparral Suites, 5001 North Scottsdale Road, Scottsdale. 5. Montelucia Resort & Spa, 4949 E. Lincoln Drive, Scottsdale. 6. Scottsdale, 6850 E. Main Street, Scottsdale. 7. Clarion Hotel Scottsdale, 5101 North Scottsdale Road, Scottsdale. 8. Scottsdale Cottonwoods Resort and Suites, 6160 North Scottsdale Road, Scottsdale. 9. Hotel Indigo Scottsdale, 4415 North Civic Center Plaza, Scottsdale. 10. Scottsdale, 6850 E. Main Street, Scottsdale.